Sacred Frankincense Essential Oil - Original Oil Gifted to Baby Jesus? 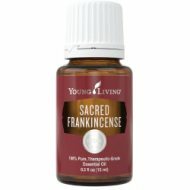 Sacred Frankincense Essential Oil - The Original Oil Given to Baby Jesus? Sacred Frankincense Essential Oil, Oman Frankincense or Omani hojari is a valuable oil is distilled at the Young Living distillery in Oman. It is one of the rarest essential oils of the world as this species of frankincense tree only grows in Oman. It is considered the most precious spiritual oil of the Middle East; and as such has not been available outside of Oman for purchase until recently. Although many texts cite that the species of Boswellia carterii and Boswellia sacra are identical, chemists and historians would disagree; as well as Saudi Royals and Oman Officials! It is believed that Boswellia sacra is the ancient species of which the oil of biblical times was created. I can tell you that the aroma of Sacred Frankincense Essential Oil is much softer and sweeter; and energetically it has a much higher vibration than Frankincense (Boswellia carterii). The chemistry profile shows that it contains a higher alpha pinene constituent as well. Immediately I feel drawn to Sacred Frankincense as it is known to increase ones spiritual connection. So if choosing between the two species for meditative work, I would definitely choose Boswellia sacra. Although the chemistry of the essential oils is slightly different the same spiritual properties of frankincense oil apply. As I do receive new information and testimonials for Sacred Frankincense Essential Oil, they will be added to this page. So check back frequently or subscribe to the Oil Blog so you don’t miss a thing! Please read below for more information on Sacred Frankincense Oil. It will tell you how to use it and what to use it for. It will also provide you with some suggestions, safety precautions for you and your pet! Want to Purchase Therapeutic Sacred Frankincense Essential Oil? Go to the Oil Shop! Available in 5 and 15 ml bottle. Buy Sacred Frankincense Oil Here! What is the Genus Species? Boswellia sacra grown and distilled in Oman. Why is this information important? There are several species of Frankincense that are grown in different parts of the Middle East. The carterii and sacra species grow in different places. What is the Origin of the Plant Name? The name Olibanum is derived from the Arabic word “al-luban” which means “that which results from milking”. Did you know that Frankincense was traded over 5000 years ago in North Africa and on the Arabian Peninsula? Did you know that Frankincense Oil was found in King Tutankhamen’s tomb in Ancient Egypt? King Tut died in 1323 BC! What are the Plant Properties? Calming, grounding and centering. What are the Documented Uses and Benefits of Frankincense? Meditation and spiritual connection. What is the Aromatic Affect on the Mind? It is uplifting and centering. Has a sweet, balsamic and warm aroma with incense-like overtones. What is the Spiritual Influence? Sacred Frankincense Essential Oil has been used to awaken our spiritual awareness and connect with spirit for 5000 years or more. It will help us release parts of our ego which hold us back from connecting with our soul, as well as feelings of unworthiness and insecurity. Use Sacred Frankincense Essential Oil during meditation to connect with spirit and stay centered in yoga or meditation sessions. It is in many of the professionally made blends that I use at the farm for the horses frequently. The top four oils I use that contain Frankincense are Into the Future, Trauma Life, Acceptance and Valor. What are the Safety Precautions? Only therapeutic grade essential oils should be used for best results, not fragrant grade oils. Because it is approved as a Food Additive (FA) and Flavoring Agent (FL) by the FDA, Frankincense Oil is readily available on the market in many different qualities. Although it may be used as a dietary supplement, it is advised not to use it in this manner for children under 6 years of age. Keep out of reach of children. Avoid using on infants and very small children. Did you know that Sacred Frankincense grows only in the Dhofar region of Oman? Yup, recent studies have now confirmed that! Did you know that Frankincense is referred to in the Bible over 52 times? To learn more about Oils of the Bible, click here. Go to the Oil Shop! Buy Sacred Frankincense Oil Here! Place several drops of Sacred Frankincense on your forehead (third eye) to assist in meditation or spiritual journeying.